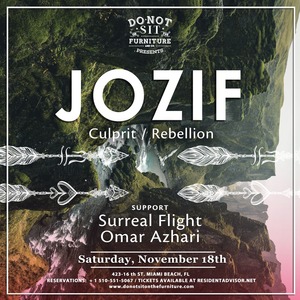 Saturday, November 18th, Do Not Sit On The Furniture presents jozif [Crosstown Rebels / Culprit] facebook.com/jozifmusic soundcloud.com/jozif Support by: Surreal Flight Omar Azhari The London born and bred artist has worked his way to where he is today with typical (to anyone that knows him) ‘jozif swagger’; passionate, determined and wildly talented he’s been charming the pants off the international circuit with his productions and dj sets alike. Craig Richards, Ben Watt, Matt Tolfrey, Andrew Weatherall, Paul Woolford and Ashley Beadle have all fallen hook line and sinker for his impossible to pigeon hole beats. An artist who himself refuses to define or describe his sound and rightly so…the music plays testament to the fact that it is there to be heard and felt…not labelled.